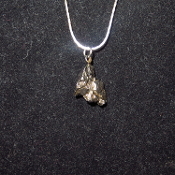 This Argentina Meteorite pendant weighs 8.4 grams. It comes on a silver colored chain with the length of your choice. This item ships free anywhere in the continental USA. This Argentina Meteorite pendant weighs 6.8 grams. It comes on a silver colored chain with the length of your choice. This item ships free anywhere in the continental USA. This Argentina Meteorite pendant weighs 6.9 grams. It comes on a silver colored chain with the length of your choice. This item ships free anywhere in the continental USA. This Argentina Meteorite pendant weighs 9.3 grams. It comes on a silver colored chain with the length of your choice. This item ships free anywhere in the continental USA.